We all know the end-of-year feeling: you’ve had a long month at work and just want to cry due to pure exhaustion, so you end up eating ice cream, drinking that bottle of wine and then feeling ashamed for not being strong enough / good enough / tough enough!. The great news, is that you aren’t alone. This past month has been so hectic on me, thank goodness I love what I do, otherwise I have no idea how I would have coped. When you feel powerless against your emotions and don’t know of a better way to cope, then you might be lacking in the emotional intelligence department. Emotional intelligence is the ability to be aware of, control, and express one’s emotions. I used to be there too, it wasn’t until I learned more about the relationship between my emotions and my body that I understood what was happening, and, more importantly, how to manage it. Mindfulness brings the knowing that there is a space between the trigger and the reaction, and there lies your power to choose. Or, better stated, between someone’s comment and your reaction lies your ability to pause to choose how it is going to affect you. Drinking that glass of wine, or having that ice cream should be a treat. They won’t solve your bad day, your bad mood, or your bad relationship. Unexplored past pain and ignoring your emotions and inner workings are what causes these feelings of inadequacies or feelings of desperation, compounded by the end-of-year exhaustion. One, healthy way in which to combat these feelings is to embark on a journey of holistic healing. This December our Breathwork Africa practitioner Marj Murray is offering her breakthrough therapy at a discounted rate of only R 400 a session, for more information and to book a session, please email her directly for bookings at marj@breathworkafrica.co.za or WhatsApp 082 561 3637. It is not just our brains that archive our journey through life, but our bodies too are left with imprints of our experiences. Breathwork is a powerful tool for accessing this archive and releasing any memories that might be trapped in the body before they turn into disease or illness. For bookings, please contact her directly on 083 961 2718 via WhatsApp. Our December promotion is sizzling hot – like our weather lately and I love it! Book now to avoid disappointment (filling up fast). Anel is also running a microblading promotion until the end of December for R1000 – save R500. 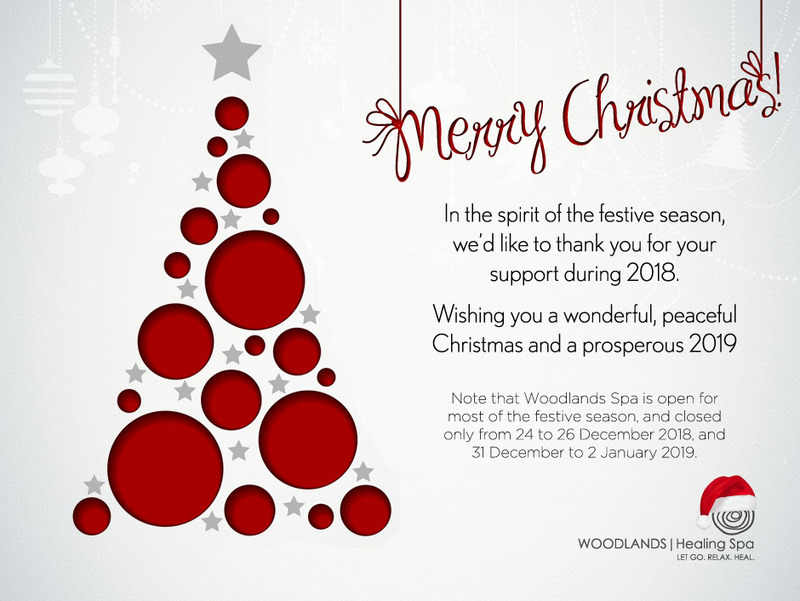 You can book directly with her on 083 236 9967 or anel@woodlandsspa.co.za. Have a look at her work on her page. SCIN aesthetics. I wish all our guests a Merry Christmas and a Prosperous New Year and we hope to see all of you for a much needed time out at the spa. Bookings for the weekend of the 22nd and the 29th of December are filling up fast, make sure you book in advance to avoid disappointment. May you all have a blessed December and for those traveling, I wish you a safe journey. Love Tania and the Woodlands Spa team.